Showcased in the heart of Oklahoma City’s Adventure District, near such landmark destinations as the National Cowboy and Western Heritage Museum, Science Museum Oklahoma and Remington Park, sits the Oklahoma City Zoo Amphitheatre, a mecca for musicians and music lovers for more than 75 years. The Zoo Amphitheatre traces its roots back to 1933, the year its construction commenced at the hands of the Civilian Conservation Corps (CCC), an organization formed under President Roosevelt’s Works Projects Administration (WPA) to carry out public works projects during the Great Depression. 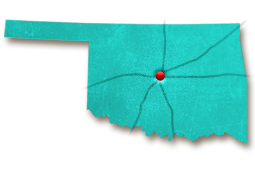 Between 1933 and 1936, approximately 400 men of CCC Companies 875 and 895 lived in tents and wooden barracks in the area while they worked to lay the groundwork for Lincoln Park, the Oklahoma City Zoo, Zoo Lake and the Zoo Amphitheatre. The Zoo Amphitheatre opened shortly thereafter as the first public works project to be completed by the CCC in Oklahoma City, featuring “The Circus of 21 Death-Defying Acts” to its first-ever audience. During those early days, the Zoo Amphitheatre hosted circus extravaganzas, pageants, theatrical performances, concerts and public meetings. The Zoo Amphitheatre has featured some of the greatest acts in the entertainment business including the Grateful Dead, Willie Nelson, Santana and more. A spring musical presentation in cooperation with the Oklahoma City Symphony Orchestra in 1971 helped resurrect the Zoo Amphitheatre, which stood in a state of disrepair due to decades of nonuse. In 1975, restoration efforts began and regular concert programs were established. The Zoo Amphitheatre was officially designated an historic site in 1983. Pivotal in the resurrection of the Zoo Amphitheatre was concert promoter Howard Pollack. Pollack came to the venue’s rescue in the late 1970s, using KATT radio to enlist volunteer labor to re-create “not just a place to see music” but “an environment.” Many civic-minded and growth-oriented companies and individuals contributed time, money and energy toward this renovation as a result of Pollack’s efforts. “I like to call this the ‘People’s Place’ because they came out to help refurbish it,” Pollack once said. Today, the Zoo Amphitheatre offers concert-goers a one-of-a-kind entertainment experience amidst towering blackjack trees and a green hillside carved out of ancient red sandstone. Over the years, more than 1 million fans have visited the Zoo Amphitheatre, many bringing their blankets and lawn chairs to place on the venue’s native rock terracing with wide grass areas. 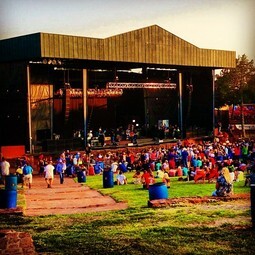 The Zoo Amphitheatre is one of the few remaining outdoor amphitheaters in the country, offering Oklahoma City area music fans top-notch, open-air entertainment. The Zoo Amphitheatre has featured some of the greatest acts in the entertainment business including the Grateful Dead, Sting, Dire Straits, the Steve Miller Band, Santana, Judas Priest, Willie Nelson, Marvin Gaye, Joni Mitchell, Heart, JJ Cale, Lynyrd Skynyrd and Oklahoma’s own The Flaming Lips. The Zoo Amphitheatre served as the film location for The Flaming Lips legendary 2006 show, “UFOs at the Zoo.” Later, in 2012, The Flaming Lips threw a free “costume party” for 10,000 fans at the Zoo Amphitheatre, an event billed as the largest costume party in the Midwest. While the Zoo Amphitheatre began as a Depression-era construction project, the amphitheater still is making headlines with world-class music and entertainment acts. The amphitheater, which locals refer to as the “Zoo Amp,” was voted as the number one concert venue by readers of the Daily Oklahoman. During which year did Howard Pollack begin converting the obsolete Zoo Amphitheatre into a 9,000 seat outdoor arena?